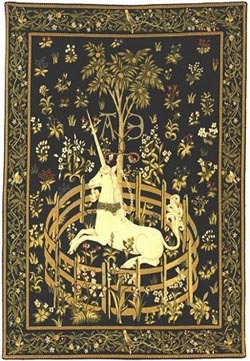 The Unicorn in Captivity tapestry is a reproduction of the original in the Metropolitan Museum of New York. Jacquard woven in Belgium. Fully lined & finished with tapestry rod sleeve. Measures 37" x 26". Please allow up to 4-6 weeks for delivery. No rush delivery available.